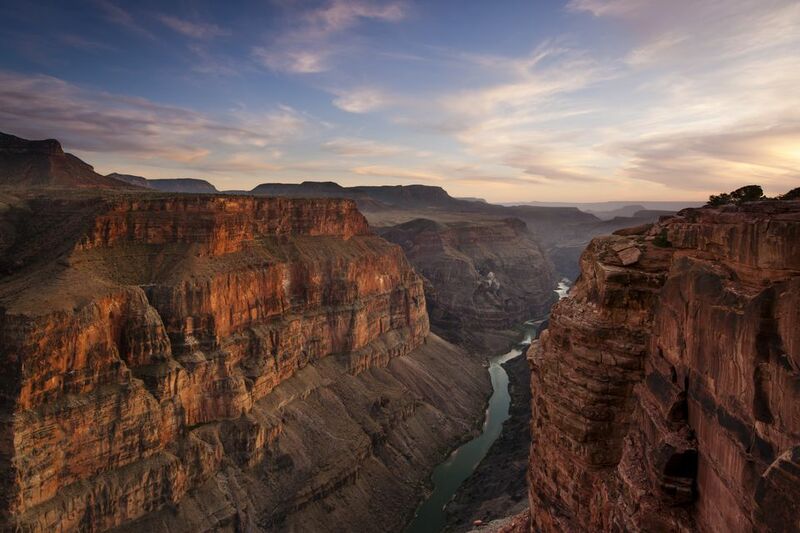 The Grand Canyon is a year-round destination, and one of the most popular national parks in America. Here's what you need to know before you go. The South Rim, where nearly five million visitors a year view the Grand Canyon, is 6,800 feet above sea level. That means it can be quite cold and snowy along the rims. At 8,300 feet, the North Rim receives about 150 inches of snow a season. Some roads close during winter months, so call ahead for information at those times. Summer (especially July) is extremely crowded. Fall is the best season for hiking, but winter often returns between Halloween and Thanksgiving. Unless you have your own private plane, there are few "painless" ways of reaching the Grand Canyon. Flying into Las Vegas and renting a car for the 280-mile drive to the South Rim is the choice of many. U.S. Airways Express flies into Flagstaff (90 miles from the South Rim), where you will also find the nearest rail and bus connections. Plan on renting a car or driving your own vehicle if you don't take a guided tour. Take a long look at a map of the Grand Canyon when your planning session begins. You might be surprised at what you find: The Grand Canyon is 277 river-miles from east to west; from North to South Rim is about 15 miles wide as the crow flies, but to drive between those two points requires 220 miles of driving along sometimes winding roads. The roads along the rims are not engineered for high-speed travel. Don't be in a hurry. The Desert View Drive (Arizona 64) that hugs the South Rim for about 25 miles is a highly recommended route. There are frequent pull-offs with spectacular views. Flagstaff (about 90 miles from the South Rim) and Kanab, Utah (80 miles from the North Rim) provide a healthy selection of hotels. Others find Williams, Arizona is a good base from the west. Hotels in these places are generally less expensive than the lodges on National Park property. But the lodges make for an excellent splurge because they enable you to see a sunrise or sunset and enjoy more leisurely viewing. They're also great for those who hike and don't relish the thought of a long car trip afterward. Beware: the number of lodge rooms is limited and reservations six months in advance are often required. The village of Tusayan, near the South Rim area, provides the requisite fast-food opportunities, but for about the same cost or less, you can purchase picnic items at the grocery there. For the money, you will have a far more memorable meal gazing out at the Grand Canyon. One restaurant that allows you this pleasure is Grand Dining Room at the North Rim, where buffet-style meals and sweeping views are available at fairly reasonable prices. If you visit Las Vegas, it won't be long before you see ads for Grand Canyon tours. Some are aerial, others are guided bus tours. These are expensive trips, so shop carefully. The prices and amenities vary greatly. Float trips and mule trips through the Grand Canyon require overnight camping, reservations far in advance and several hundred dollars per person. A memorable and less expensive alternative is a float trip down the Colorado River in Glen Canyon (east of Grand Canyon). These half-day trips don't cross rapids and begin in Page, Arizona. They end 15 miles downriver at Lee's Ferry (Adults $86, Children $76, plus a river use fee of $8). While that might not seem like a bargain at first reading, it is far less expensive than investing several days in the Grand Canyon float trips. It's received a lot of news coverage as a unique opportunity to literally walk over the Grand Canyon from a platform of three-inch-thick glass that juts out 70 feet. It is located at the end of a 14 mile-long road in on Hualapai Reservation land. The Hualapai Tribe needs the revenue from these visits. You can book a package deal that includes access and the Skywalk for about $80 per person. The details of a visit to Skywalk are important to consider before you make the commitment to go. Beware of altitude-related problems. Most rim locations are around 7,000 feet above sea level. There are very few guardrails, and a few visitors each year slip over the edge to their deaths. Shortness of breath and altitude sickness are common problems here. Maintain a slow pace and drink plenty of fluids. Hiking is unusual here. One T-shirt proclaims hiking the Grand Canyon is "more than a walk in the park" and the rewards are great. So too are the perils. Don't be fooled into venturing down a trail into the canyon and then having to face the grueling climb back to the rim. This is a common cause of injury, and medical facilities for more advanced problems require distant and expensive trips. Get detailed information about hiking here and make a realistic appraisal of your ability to complete the trip in light of your available time and physical ability. There is much to see within a day's drive of the Grand Canyon. Unless you're making a day trip from Las Vegas (it will be a very long day), try to combine your visit here with many other spectacular places in the region. Zion National Park in Utah is a relatively short, scenic drive from the North Rim and offers outstanding hiking opportunities. Page (90 miles NE of the South Rim) is a starting point for float trips on the Colorado River or vacations on Lake Powell. South of Flagstaff is the gorgeous city of Sedona, with its famous red rock landscapes that have inspired generations of artists. Combine entry fees with other attractions. Admission here for a vehicle with up to four passengers is $30. If you plan to visit other national parks within the next year, consider buying an annual pass for $80. The pass has an added benefit of placing you in shorter passes-only entry lines. This pass was $50 prior to 2007, but with the higher cost comes admittance to national monuments and federal recreation lands. Stock up on gasoline before arrival. The fuel that is available close to the canyon is often more expensive than in Flagstaff or Las Vegas. But the larger problem is a general lack of gas stations. Running out of gas along the rim of the Grand Canyon is even more costly. In summer, avoid crowds by visiting the North Rim. Some claim North Rim views are a bit inferior to those from the South Rim but count on less congestion. From Las Vegas, the North Rim is a shorter drive.